The opening page of the website of Freedom 251, pitched as the world’s cheapest smartphone, assures customers of its “best intentions” and says fresh bookings have been closed. The letter from the Freedom 251 team also says the company has decided to offer only cash-on-delivery to avoid any inconvenience and is in the process of compiling all the emails it received from customers and will issue phones to the first 2.5 million registrations “very soon”. There is no reference to the fact that the management was forced to refund its customers the entire booking money of Rs 63 crore (Rs 630 million) raised during the initial registration, priced at Rs 251. These are yet to see the light of day even though the promised time (mid-April) when the first lot was supposed to be delivered has passed. Freedom 251’s launch in February must be a distant memory for its promoters who find themselves in a legal mess. The three key people behind the idea of Freedom 251 - Mohit Kumar Goel, Dharna Garg and Ashok Kumar Chadha - are currently fighting cases in the Allahabad High Court to avoid arrests for collecting money through an alleged Ponzi scheme. A Ponzi scheme is a fraudulent money collection cycle in which investors are paid returns from newly collected investments rather than from profit made through legitimate business operations. While Goel is the majority stake holder in Ringing Bells, the company behind Freedom 251, Chadha is the president. Garg is Goel’s wife and does not have any ownership rights directly. The promoters were dragged to court on the basis of a first information report (FIR) filed by Kirit Somaiya, a member of Parliament. The FIR accused Goel and the company of cheating and dishonesty under Section 420 of the Indian Penal Code, among others. However, Abhishek Vikram, the promoters’ lawyer, says the FIR is an attempt to derail the launch. A division Bench, comprising B K Narayan and R N Mishra, has given them some temporary relief though, by asking authorities not to take coercive action till May 18, the next date of hearing. The Bench has also permitted the promoters to file an application for the release of their passports, which were seized. But legal hurdles are not the only ones that stand in the way. While the cost management and sustainability of the project has been questioned by established players in the market and industry experts, there were several other contradictions in the company’s claims. During the February 18 launch event, Chadha and Goel said the handsets would be manufactured at company-owned units in Uttarakhand. Six days later, he told Business Standard that the devices were being imported from third-party manufacturers in Taiwan and would reach customers from mid-April. This version also changed within a fortnight. This time, the products, they said, would be made at two plants in Noida and Janakpuri in Delhi, operated by “partners” of the company. Various government agencies like the Enforcement Directorate and Income Tax Department have also sprung into action to look into Ringing Bells. The promoters’ list of woes increased after Adcom Mobiles, the seller of the Freedom 251 prototypes that Chadha and Goel showcased during the launch graced by Bharatiya Janata Party veteran Murli Manohar Joshi, threatened to sue the company over violation of usage rights. Ringing Bells did not have rights to use its phones commercially, Sanjeev Bhatia, founder and chairman of Advantage Computers (Adcom), alleged. 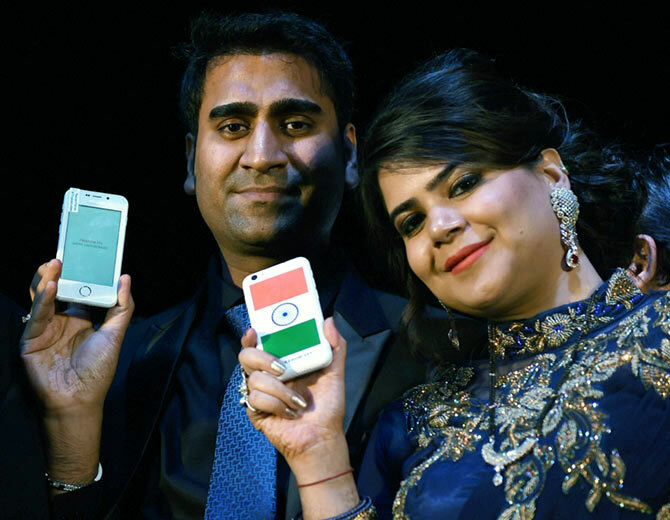 Meet the low-profile businessman who launched a smartphone for Rs 251!